New York Style Bagel Crisps Make a Perfect Snack! I’m a big snacker, so I love finding new snacks that are a good alternative to calorie and fat loaded potato chips because I often crave things that are salty and crunchy. I also need my snacks to be quick, because often I’m grabbing one while I’m on the go. New York Style Bagel Crisps are a declicous and satisfying snack that I recently got to try out. 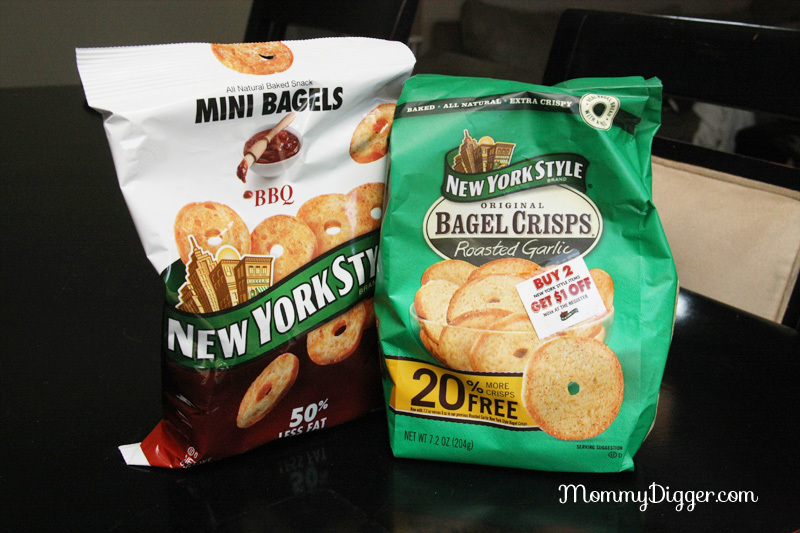 I recieved New York Style Original Roasted Garlic Bagel Crisps and Mini BBQ Chips and they’ve become a new favorite in our house. The Original Roasted Garlic chips were so yummy with a smudge of cream cheese or my husbands favorite, gouda. Though, even just plain, they tasted delicious. After my husband tried one, he said it would make a great breading. So, what did I do? I placed some in my food processor and made them into a breading for chicken. It was a hit and so easy to do, it makes a great dinner for those busy days that I work because its so simple and fast! The New York Style BBQ Mini Chips were also delicious and had a sweet BBQ flavor. The minis are about half the size of the Original style bagel crisps which made them easier for on the go snacking. New York Bagel Crisps are really great for get together’s with friends and family, just put them out on a nice dish with some cheese spreads and you have an instant snack for your guests. They are perfect for summer entertaining and BBQs! To learn more about New York Style Bagel Crisps follow New York Style on Facebook and Twitter. Also, be sure to check out and enter to win, the Bagel Snack Star Sweepstakes! Visit and “Like” the New York Style Facebook page and enter the Bagel Snack Star Sweepstakes, you will be entered to win a red carpet movie experience with your friends and family! One Grand Prize winner will have the chance to win a private VIP photographed and catered experience at their local movie theater. New York Style will rent out the theater for you to host the ultimate experience with 50 friends. The winner will also receive a gift card for a year supply ($500 worth) of movie tickets. My mom loves these. I’ll have to try them. We love these too – so yummy! These are absolutely wonderful! I love take cream cheese and cilantro and spreading it on them. I will have to try these. On my way to their facebook page to enter the contest. I just got some of those the other day and dipped them in hummus! It was so yummy! I haven’t tried these yet, but you sure made them sound yummy! We’ll have to give them a shot. And for breading…who knew? Thanks for the review! These look really good. I think I should try a tomato mixture topper on these. I’ve always loved these. Can’t wait to try the minis! I love these. We sometimes offer them in our Diabetic classes with light cream cheese-so patients don’t think they have to give up “crunch”. Thanks for the review! I just bought a bag of these after reading your review. I just love them. We didn’t even use anything to dip them into. Thanks for sharing. So glad you enjoyed them as much as we do! They are super yummy! These look yummy! We are big snackers in my house too and these might be a better alternative fir us than chips!! Awesome idea of the use for chicken. I can’t wait to go get some to try it. Thanks for sharing. I had to come back and just tell you how awesome the chicken was with the Roasted Garlic Bagel Chips. Thank you so much for the idea, husband just loved it. These are awesome with hummus! Oh my! Those would be DELISH with some Spinach dip… YUM! I am so snacky these days while breast feeding. Those look delish! I don’t like potato chips because they are too salty. I bet these would be awesome with some hummus.